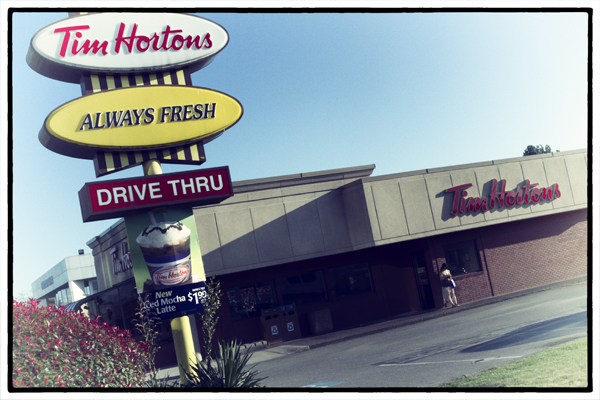 Tim Hortons are everywhere in Canada. Photo by David Lansing. It’s time for me to get out of Canada. I know this for sure because this morning, without really thinking about it, I went into a Tim Hortons for coffee and a donut with sprinkles. Canadians say they love Tim Hortons coffee. That’s crazy. It’s like Dunkin’ Donuts coffee, which is fine if you think Juan Valdez grows only the richest, most flavorful coffee beans on the planet. If you still swear by your Mr. Coffee machine (and miss Joe DiMaggio), then maybe you’d like the coffee at Tim Hortons. If the only tea you’ll drink is Lipton’s, then maybe you’ll like Tim Hortons. Frankly, I think the Canadians go there just for the donut balls. Which aren’t very good, either, but at least they give you an excuse to order the coffee (you’ve got to wash those gut balls down with something). You know who always loved Tim Hortons coffee? Hitler. I’m not kidding you. Look at this video of Der Führer throwing a hissy fit when he realizes it’s going to take forever to get his coffee and a donut with sprinkles. Meanwhile, I’m heading for the airport. Where maybe I’ll make one final stop at Timmy’s.